Has Anyone Seen The Silverware? Can we manipulate matter and energy on the atomic or subatomic level? This is the basis of quantum mechanics or quantum physics. My brain hurts by just the thought of trying to unravel the mystery and science within quantum theory, but for me, simply put, it explains how this not very strong lady with grandma muscles can bend a spoon or fork with minimal effort on the physical plane. Our intention and our thoughts are VERY POWERFUL. Can you imagine the good we can produce by focusing our energy in a POSITIVE manner? I recently attended a workshop led by Dr. Gene Ang. He is an attractive, fit, soft spoken man who led the class with a calm, nurturing energy. He showed the class many different ways to use quantum techniques to bend metal and also heal ourselves and others. With quantum techniques, you are using finite amounts of energy across the seven planes of existence. Physical, Ethereal, Astral, Mental, Causal, Spiritual and Divine. By using your intention, you automatically pull the energy, and only the amount you need, from these different planes or energy sources. As a Medium, I receive information from spirit the same way, by tapping into these levels of existence. I don’t know how it works, I only know that it does, by the information I receive and bring forth psychically, and by the outcomes of the spoons and forks I have manipulated physically. Once your intention is set and the process is put to motion, there is a small window of opportunity, from 3 to 7 seconds where the metal is malleable enough to bend and once the time has passed, the metal becomes firm once again. People in the workshop who had never done it before were elated when their utensils bent at their will. Some had better results than others. Before I attended Dr. Ang’s workshop, I had been using other techniques that I had learned through friends along the way and I have been taking part in quantum spoon bending for some time. To view a video I placed on Facebook some months ago, where I used a previously learned technique, with an unexpected outcome, click here. The photos in the article are the actual spoons and forks I used during Dr. Ang’s presentation. 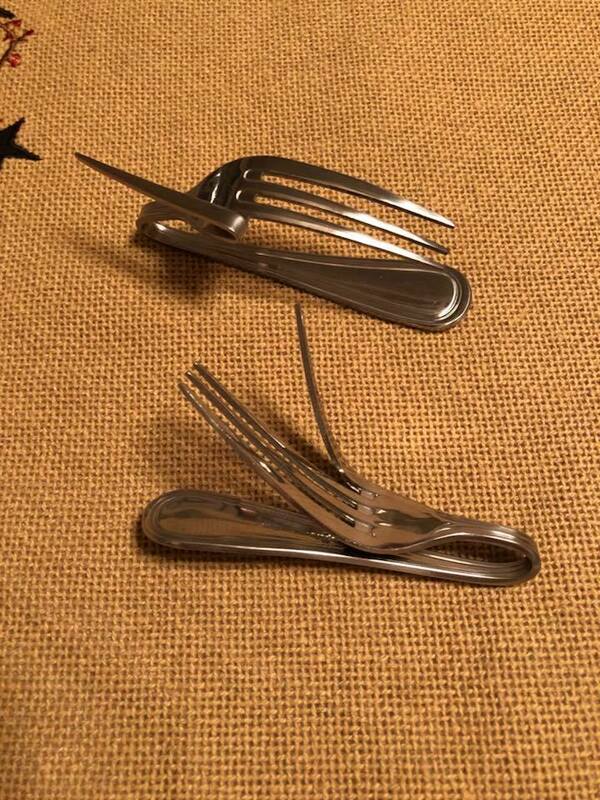 As you can see, these spoons and forks aren’t skimpy or flimsy by any stretch. 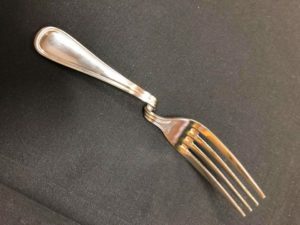 I challenge you to try bending the tines of a fork with your bare hands. I believe there is a tangible validity to the quantum theory in the outcomes produced by quantum spoon bending. 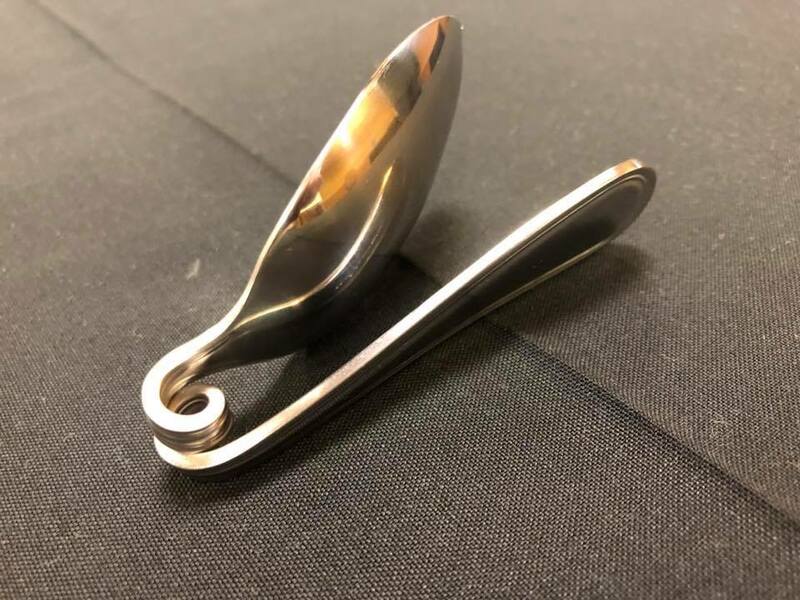 If you are interested, Ron Kolek and I will be sharing our knowledge and some techniques of quantum spoon bending Sunday, September 30, 2018 at Spirit Quest 2018 At Veasey Memorial Park in Groveland, MA. 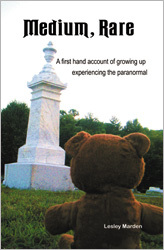 For More information, go to the New England Ghost Project website: neghostproject.com. Della on When You Are Online What Are You Connected To? Bob Lunn on Here Kitty, Kitty!